Little is it known that Sri Lanka’s Muslims have made a big contribution to Sri Lanka’s cultural life. 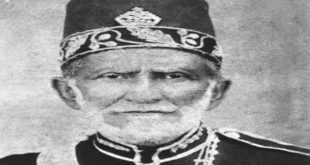 They significantly influenced local culture in matters of food, dress, jewellery and pastimes, testifying to the close relations that existed between Muslims and other communities of the island, especially the Sinhalese and Tamils. Sri Lankan Moors, descendants of Arab merchants who espoused local women, contributed in no mean measure to the island’s culinary culture, attire and ornamentation while their Malay co-religionists whose ancestors hailed from Indonesia contributed not only to local cuisine, but also succeeded in introducing a couple of popular national pastimes. The Arabs and their Moor descendants have made a small, yet significant contribution to Sinhalese society in matters of food. The aluva, a class of popular confections, have their origins in the Arabic halwa ‘sweet’ suggesting that it were the Arabs who introduced this sweetmeat. This item has been in existence among the Sinhalese for some time. Robert Knox in his Historical Relation of Ceylon (1681) gives alloways as flat sweetmeats in the fashion of a lozenge showing that they were in existence among the Kandyan Sinhalese of his day. A popular beverage sold in Sinhalese wayside booths to this day is saruvat, which is prepared with the juices of various fruits. This drink has its origins in the Arabic sharbat ‘drink’. Benjamin Clough in his Sinhalese-English Dictionary (1892) gives saruvat as ‘sherbet’ showing that it had been known among the Sinhalese for quite some time and may go back several centuries. Among Muslim introductions to popular food culture may be mentioned the buriyani, a rich rice dish made of fine-grained basmati rice and a copious quantity of mutton or chicken cooked in ghee. Indeed so popular has this meal become that even the local chain of Kentucky Fried Chicken now offers it as part of its regular menu. The same holds true of the dessert known as Vattilappam which is made of eggs, kitul jaggery and spices, which is fast gaining popularity among other communities, so much so that cups of it are now being produced commercially for local consumption. This delectable pudding is perhaps best described by J.P De Fonseka (A Gourmet’s Guide to Ceylon. Times of Ceylon Christmas Number 1937) who wrote about it nearly eighty years ago as follows: “The Muslim’s is a sweet tooth. He has a pudding (for which Allah be praised) called wattiliappam, a soft, succulent one of jaggery and eggs and all the spices of the earth, which goes down with a demure sweetness like that of the houris in paradise”. The Malays too have contributed their share to local culinary fare. One such notable contribution is the Sambola, a preparation of grated coconut, onions, chillies, lime juice and salt very often consumed as a relish in Sinhalese homes. This dish could be traced back to the Malay sambal. Another Malay contribution to Sinhalese fare is the pickle known as achcharu made of fruits such as mango, hog plum and wild olive which has its origins in the Malay achar. Among the sweets of Malay origin that still figure in Sinhalese festivities is the bibikkan, a baked brownish cake made of flour, scraped coconut, sugar and chopped cashewnuts which has originated from the Malay bikang ‘rice flour cake’. Dodol, an oily, dark-brownish sweetmeat made of rice flour, coconut milk and sugar, jaggery or treacle widely prepared in Sinhalese homes likewise has its origins in the Malay sweetmeat of the same name. Another Sinhalese item of Malay origin, though hardly if ever made nowadays is the sinakku which has its origins in the Malay Cheena-kuve ‘Chinese Cake’, apparently because they were prepared in little cups or bowls of Chinese origin. Among other Muslim groups that have contributed to local culinary fare are the Bohras who were instrumental in introducing a well known item known as godamba rotti, a sort of thin bread made with wheat flour, which is commonly made in local eating houses. J.P Fonseka in his Gourmet’s Guide to Ceylon tells us that “Borahs specialise in godumba roti, a creation of eggs and flour” suggesting that this item was introduced by this group of people. A further embellishment of the godamba rotti is seen in what came to be known as kottu rotti prepared by mixing chopped godamba rotti with a rich mix of vegetables, meat and eggs. This dish too was invented by local Muslims, for commercial purposes to be served in their eating houses. It has today become a very national dish transcending ethnic barriers and has even had Sinhala songs dedicated to it. Such is its popularity. It is also possible that Muslim traders introduced the moṭṭappili, a shawl used to cover the head and the upper part of the body which figured prominently in the attire of Kandyan women at one time, especially in the days of King Rajadhi Rajasinha (1782-1798) and after as is borne out by temple paintings in Degaldoru and Mulgirigala among others. Luxurious lace work known in Sinhala as kasav ‘gold lace’, ‘gold fringe’ also seem to have been introduced by Muslims since the very term derives from Arabic qasab ‘fringe or lace of a garment’. 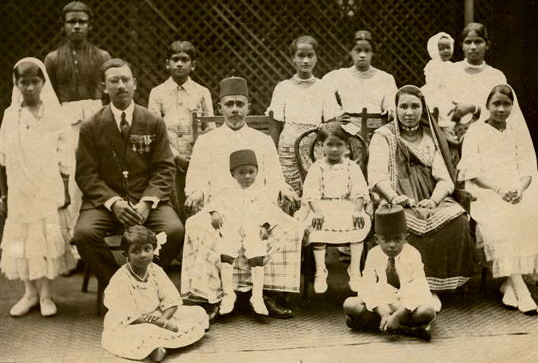 The Malays too contributed significantly to local attire. Among these is the sarong, the traditional lower garment of local Sinhalese and Tamil men which differs from the dhoti of India in being a tubular lower garment worn from the waist downwards. The Sinhala term for the garment sarama as well as the local Tamil term for it saram have originated from the Malay sarung or sarong. Likewise, the Sinhala term for ear-studs karabu has its origins in the Malay kerabu showing that it were the Malays of old who introduced this class of ornaments. Although the Muslim cultural contribution to local Tamil society has not been very significant, the introduction of nose ornaments is notable. No ornament on the face of the earth enhances a woman’s allure so much as a nose ring or stud. As such this is a very important contribution of Muslims to feminine culture. As shown by Dr. A.S.Altekar in his Position of Women in Hindu Civilisation (1938), nose ornaments were unknown in India throughout the entire Hindu period and was clearly borrowed from the Muslims. In fact, nose ornaments are attested amongst Muslim peoples, especially Arabs, for several centuries. For instance, Sir Richard Burton in his Narrative of a Pilgrimage to Al-Madinah and Meccah (1893) refers to the Bedouin women of Arabia wearing nose-rings. The Qashqadaria Arabs of Central Asia believe that nose rings were worn by their ancestress Hagar, and that Abraham was so charmed with them that it became a tradition among Arab women. Especially interesting in the local context is a horde of jewellery excavated in Anuradhapura in the 1940s which included a lady’s nose ornaments in association with a necklace with gold coins in Arabic characters struck in the name of a tenth century Abbasid Caliph of Baghdad (Report on the Archaeological Survey of Ceylon for 1946. Senarat Paranavitana. 1948). Yoga Vallipuram (Traditionally Yours. Times of Ceylon Annual 1964) tells us that the mookuthi or nose stud in shapes like crescent moon or star was once considered an essential ornament for married Tamil women. “Today” she says “only girls brought up in orthodox families have their noses pierced for these studs”. She adds: “But if today’s bride does not wear the mookuthi, she certainly does the tiny droplet called pullakku which hangs from the end of her nose, just above her lip”. Vallipuram’s reference to the pulakku or nose-pendant is interesting as both the name and form of the ornament suggests an Arab origin. Captain F.M.Hunter (An Account of the British Settlement of Aden in Arabia. 1877) refers to the Bulakh which Arab women wear as “a flat gold crescent, chased and stamped, studded with pearls, having a fringe of pearls on the outside; it is worn suspended from the central membrane of the nose by a semicircular wire which joins the horns of the crescent”. Thus it can easily be deduced that the pulakku worn by local Tamil women had its origins in the bulakh of Arabian women, especially since we know that the Tamil language turns an initial b into a p when borrowing from foreign languages. The Malays also made a small but important contribution to Sinhalese society by way of pastimes. One such is the rabana, a large circular drum played by women during the Sinhala New Year to the accompaniment of songs known as raban pada. This item has its origins in the Malay rebana, especially the type known as rebana ubi. The Malay term itself seems to derive from the Arabic rabbana ‘Our Lord’, which figures prominently in Islamic devotional music sung to the accompaniment of the drum. The popular pastime of kite flying also seems to have been introduced by the Malays. The Sinhala term for ‘kite’ sarungalaya seems to be connected to the Sundanese sarenkol ‘a small tubed bamboo, crooked at every joint, diverging at some angle from the preceding one’ or sarang ‘cross laths of split bamboo’, it being understood that bamboo is ideal for making kite frames. This is supported by an observation made by Louis Nell in his Explanatory List of Portuguese Words adopted by the Sinhalese published in The Orientalist over a century ago. He refers to the word gaviam meaning sparrow hawk applied by the Sinhalese of his day to hawk-shaped paper kites for flying, some with an Aeolian contrivance in a vibrating thin ribband of bamboo reed stretched to a bow and emitting a strong sound in a high wind. This, he says, used to be prepared by the Malay population. Previous Singing & Music in Islam – Halal, Haram or Middle Ground?